Here you can find out what to expect on your first visit with Dr. Snider, as well as informational packet, office and billing information, and our policies. Please Download the patient packet here, complete the form, and bring with you on your first visit. 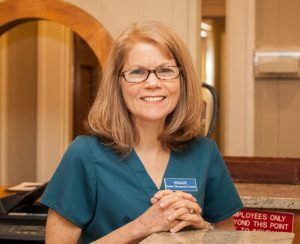 Peggy is Snider Chiropractic Center’s office manager. She has all of your answers to your insurance and medicare needs. We accept most insurance plans including Blue Cross Blue Shield, Medcost, Cigna, Medicare, Medicaid, CareCredit and more. Please call 828-253-9856. to speak with her. More questions and directions click here. If you would like to make an appointment, please contact us. Appointments are available and welcome, especially for new patients seeking help. We are proud to provide a state-of-the-art facility for the highest quality chiropractic care available. Our office is the oldest Asheville Chiropractic. It has always been one of our top priorities to protect the well-being of our patients. We are confident that you will feel right at home in our office as we welcome all patients as if they were family.